AVIXA: What’s IT Got to Do With AV? After years of careful reflection and analysis, InfoComm’s team has recognized that an evolving audiovisual industry required a realignment from its representative trade association. Therefore, drumroll, InfoComm has rebranded as AVIXA, the Audiovisual Integrated Experience Association. InfoComm will remain the name of the annual trade shows, but AVIXA is now the name of the association. As its acronym suggests, AVIXA promises to put “AV" first and prioritize the integrated experience. But in the name change, have two other important letters—IT—been demoted? During the September 13th press conference, Dave Labuskes, AVIXA’s CEO, emphasized that “AV is not the IT industry” and that "IT is an enabling technology" for proAV applications. Brad Grimes, director of Communications, AVIXA, offered more context to AVIXA’s perspective that AV is not a subset of IT. “AVIXA recognizes that information technology is one of the building blocks of today’s audiovisual experiences—along with audio, video, control, and other technologies,” Grimes stated. While IT is a unique category with its own set of considerations and competencies, many industry stakeholders see "IT" as a fluid term rather than finite. More and more IT departments control AV budgets, and many AV and multimedia managers work within IT departments. Professionals with titles like "IT director" are tasked with the upkeep of AV equipment. Additionally, AV and IT categories continue to converge as AV applications are brought onto IT networks. For example, in an AV-over-IP project, you can send uncompressed audio and video information over standard IP mediums. You can also encode sources and stream content with some compression over IP. Various audiovisual providers are partnering with IT suppliers, such as QSC's move to run the fourth-generation of its popular Q-SYS software on a Dell EMC PowerEdge R730 server. Technology directors in commercial facilities are reporting more convergence not less. "IT and AV will continue to merge," according to Robb Mann, CTS-I, manager of integrated technologies at University of North Carolina at Wilmington, with "everything eventually ending up on a network." He said that devices and services will need to speak a common language in order to be viable, and security for networked devices is going to be paramount as the IoT takes over. “Manufacturers had better start planning and implementing it now or they will be left behind." Mann’s AV team has been a part of IT at UNCW which offers benefits. “We were well-situated when convergence started impacting the industry and marketplace. For example, we were able to quickly and easily collaborate with our Network group to set up a Class-B AV subnet for all of campus, which we manage (with Network oversight, of course)." This allows the team to add devices to the AV network quickly and easily compared to other institutions. Justin Rexing, M.S., CTS-D, ISF-C, DMC-E-4K, AudioVisual Systems Engineer at Western Kentucky University, concurs. “At Western Kentucky University, Audio Visual Services is a part of the Communication Technologies department. Communication Technologies is part of the Information Technology Division. I don’t see that changing anytime soon,” he stated. Reality Check: AV is Part of IT. And That’s a Good Thing. Rexing believes that IT is a "term used to explain the services and systems used to secure and transmit data and information that support the mission goals of the university or corporation." “The Internet is not the hula-hoop of today—it’s not going away, and it isn’t shrinking,” observed tvONE’s product manager Mark Armon in an interview with NewBay Media. “More and more users are becoming proficient in certain aspects of IT and therefore expectations of AV gear are increased to encompass things like interoperability, collaboration and instant access." 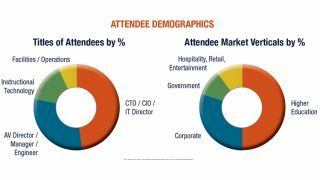 Cindy Davis, producer of the AV/IT Leadership Summits, revealed that, since its launch in August 2016, more than half of the Summit attendees come from IT departments or IT-focused groups within hybrid tech teams. Most Summit attendees identify themselves as AV/IT, not one or the other. Conversely, AV managers are embracing the IT knowledge they need to remain a vital stakeholder and continue to champion audiovisual applications. The keynote for the upcoming AV/IT Leadership Summit in NYC, November 9-10th, exemplifies the true hybridization AV and IT. Global Head of IT Operations at Bloomberg, Lt. Jeffrey Fairbanks, stressed, “Context and data matters, but we can’t lose sight of the end user experience.” His keynote will discuss the AV/IT ecosystem, from how a high-res display is a proxy for adding greater value to ensuring ease of communications. The AV/IT Leadership Summit curriculum aims to move the dialogue and knowledge-sharing "beyond just the idea of convergence AV and IT into next-level planning,” Davis said. The goal is to empower leaders and inspire more agile strategies. Visit AVITSummit.com to learn more.